The Search Suit was designed for personnel involved in searching for and clearing of explosive devices, and has been developed to meet the specific needs of a search team. Although the suit is significantly lighter than the standard EOD Bomb Disposal Suit, it provides the user with all round protection, unmatched mobility and virtually unrestricted movement. The outer garment of the suit is constructed out of Nomex III and includes the latest Kevlar New Technology Fibers. JACKET : Provides front, back, side, shoulder and neck protection with the additional optional feature of up armor pockets. GROIN PROTECTOR : This can be worn in either the lowered or raised position. TROUSERS : The unique design provides freedom of movement and optimum protection to the legs. HELMET AND VISOR : This work in conjunction with the jackets high collar to provide the optimum protected area. 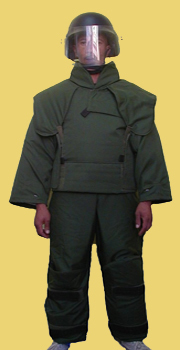 Jacket (front & back), arms and leggings – Ballistic protection level IIIA (NIJ) & fragmentation to 600m/s. Helmet – Ballistic protection level IIIA (NIJ) & fragmentation to 600m/s.